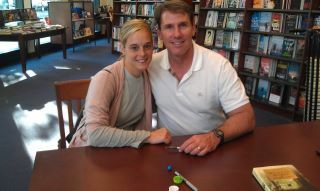 So, I recently met my favorite author, Nicholas Sparks, a couple of weeks ago at his book signing for his new novel, The Best of Me (which is already on the NY Times Best Seller list after just 2 weeks!). Even though I spent only 5 minutes with him after waiting in line for over an hour, it was awesome! But what was more exciting for me, I think, was getting a taste for what it could be like to be a successful writer. Now, it goes without saying that there is only one Nicholas Sparks. Every novel he writes is pretty much a guarantee to make the best seller list and become a major motion picture. I can only dream to be as successful as he is, but for me, if you don’t have dreams, than what is there to live for? Even if they don’t come true, at least you tried and hopefully had some incredible experiences along the way that you wouldn’t have had otherwise. To me, dreams are the fuel for the fire that keeps my zest for life burning. The most important question in life, for me personally, is “what if?” I love the “what if” in life. What if I could write that? What if that many people wanted to read my books? What if that many people waited in line for over an hour just for me to sign my book? The line to meet Nicholas was like a maze as it weaved in and out of the aisles of The University of Pennsylvania bookstore. And as I waited, I would scan the books, imagining seeing my name on my very own novel amongst the literary adventures that filled the shelves. It gives you such a high (well maybe it does if you aspire to be a novelist) and begs that ever important question: “what if?” What if my novel was on that shelf? As I write my first novel, I find myself asking “what if?” all the time. What if my character does this? What if my character says that? How will the rest of the story turn out? And sometimes, I will write several versions of that chapter answering all of the “what ifs”. But tonight, as I sit in front of my computer, I ask myself another couple of “what ifs”. What if I didn’t get writer’s block? What if I write on my blog, will it help clean up the clutter that that has been accumulating in my mind trying to answer all of these what ifs in my story? I don’t know. Maybe. I guess we’ll find out. As I try to muster through all of these “what ifs” that have consumed my mind as I journey through life, I always end up asking myself my second most important question: “why can’t I?” Well, you know what? Maybe I can’t, but at least I tried.